Come visit 621 Gallery for our free Art Happy Hour, a monthly event where artists come to the gallery to talk about their exhibited works. 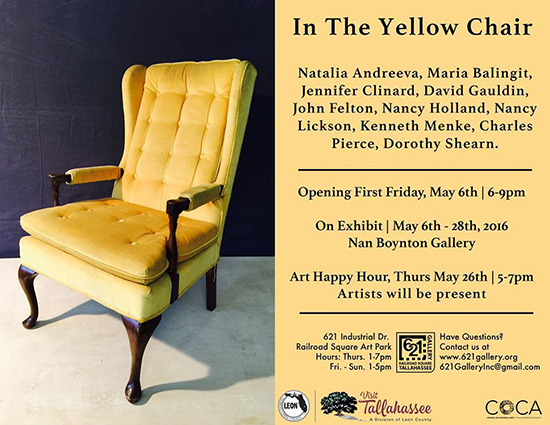 This month, artists featured in “In The Yellow Chair” will be joining us to discuss their works in the exhibition. Featured artists include: Natalia Andreeva, Maria Balingit, Jennifer Clinard, David Gauldin, John Felton, Nancy Holland, Nancy Lickson, Kenneth Menke, Charles Pierce, and Dorothy Shearn. This event includes artist talks starting at 6pm, a Q&A session, and light refreshments.